A new world is emerging out of the volatility and uncertainty of the Fourth Industrial Revolution. Over the past two decades, technology has entirely rewritten the code on how we live, work, and relate to one another. Somewhere in the world right now, there is very likely a working prototype of an innovation as profoundly disruptive as the internet itself. As observed by the World Economic Forum, the First Industrial Revolution in the 18th century gave birth to a new world by replacing animal-powered labor with mechanical devices and engines. The Second Revolution in the 19th century electrified mechanical devices and introduced previously unimaginable economies of scale. The Third Revolution a century ago was kicked off by the transfer of industrial and logistical control from humans to computers. The Fourth has just begun. The 21st century began with a convergence of all past advances in power and energy. Mechanical devices, electrified systems and self-healing networks of distributed computers are all merging with biological systems. In all honestly, no one can say where that will lead us. However, there is one competitive advantage that can guide leading organizations through a market characterized by volatility, uncertainty, change and ambiguity. A culture of innovation will keep your organization agile, foreseeing, relevant, and growth-oriented no matter what the future brings. To learn more, read our Complete Guide to Business Innovation. This business survival manual is your companion for the new world – where disruption is driving excellence in customer experience and “coopetition” is the new normal. 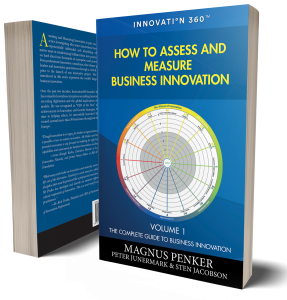 Beginning with Volume I: How to Assess and Measure Business Innovation, you will see your business in a new light – not as a collection of tasks organized around a core value proposition, but as an adaptive brand that consistently introduces novel concepts to make life better for your customers. Contact Innovation360 to get an honest appraisal of your organization’s innovative strengths and what you will need to reach your goals your future. Source: Penker (2016). Based on the work of Magnus Penker, Ralph-Christian Ohr and Kevin McFarthing, on Jaruzelski & Dehoff (2010), and Loewe, Williamson, Chapman Wood (2001). All the data were collected and analyzed in InnoSurvey (2016). Measure your own organization’s capabilities using Innovation360’s readiness assessment, the https://innovation360.com/assessmentInnoSurvey®.